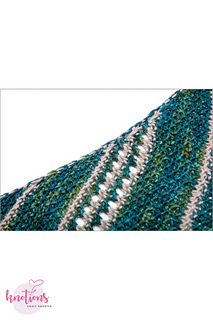 The Pebbled Shawl was designed as the solution to a problem – how to use variegated yarn! We’ve all done it at one time or another – become smitten with an oh-so-pretty variegated skein and brought it home, only to find (to our utter disappointment) that it either pools unattractively or else the fabric looks like nothing in particular! I had a skein of variegated with very short color changes that just didn’t work well in the usually recommended seed, moss or slip stitches – a frustrating puzzle which was only solved after much swatching. This shawl is the result. 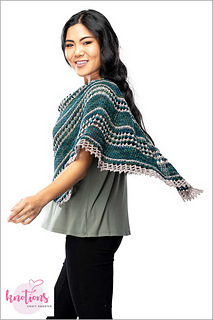 It needs just 100 grams of variegated yarn, and 50 grams in a solid colour – perfect for using up those lone skeins! 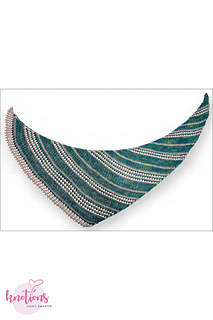 The curved, asymmetrical crescent shape is easy to wear. 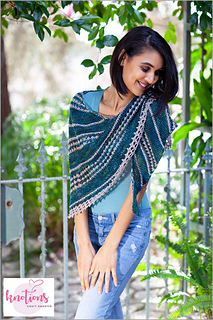 Best of all, this pattern is versatile – use the recommended needle size for a lacey shawl or go down a size or two to produce a more textured fabric that still retains plenty of drape. Check out the project page to see lots of texture! 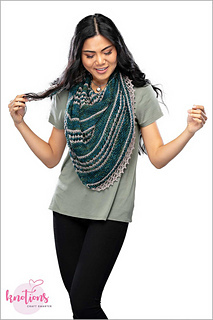 Size is adjustable – stop when you like or when you run out of yarn, or simply continue to desired size. Rows 27-38: With MC, work Rows 3&4 in Body Pattern, then 2 reps of Rows 1-4, then work Rows 1&2 (12 rows); (26 sts).